With this setup, tests have to go through to the MediaWiki server, ResourceLoader, and then run in the browser. This is especially noticeable in development mode, which we often enable to get readable stack traces and error messages on test failures, but makes the test run take a lot longer. There are also big startup costs, for powering up vagrant and the whole system. As a result of this, writing tests is costlier than it should be, which discourages developers to write and run tests, and over time ends up affecting the quality of our code and QUnit test suites. It also puts significant barriers to TDD style workflows, which rely on constantly running tests and require a fast feedback cycle with the developer. In this environment, the real MediaWiki, global state, and the browser environment are available. As a result, tests are written often as integration tests, relying on implicit behavior, modules and state being available to perform the testing. This is not a problem by itself, integration tests are important and have very valid use cases and a place in the testing process, but this environment itself makes it extremely complicated to write isolated unit tests, because of all the global state, variables, and existing loaded code. As a result, tests written end up coupled to implicit behavior and state, which makes them very brittle or overly verbose because of the extensive mocking, and most of them are big integration tests, which makes them slower to run. All of this adds up to the previous point, making it an even slower moving setup for writing tests, with the same outcomes. You can read some more details in the architecture design record 7. 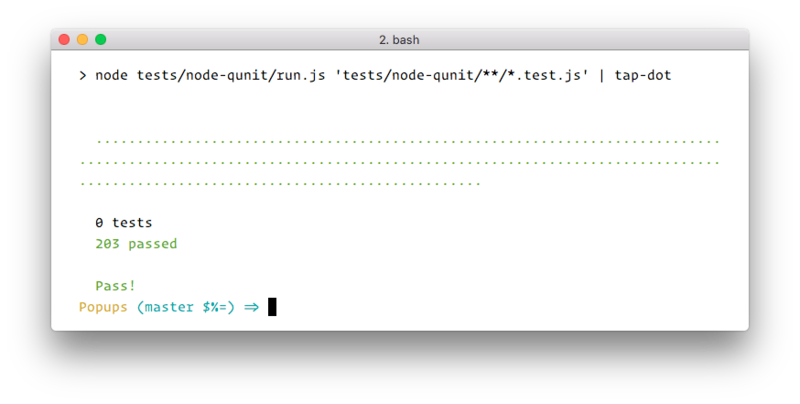 Prefer running QUnit tests in Node.js. We implemented a new npm script test:node that is run in CI as part of the script test on the npm job of the extension. Tests were slowly migrated to tests/node-qunit from tests/qunit if it was possible to make them isolated. Integration tests were kept in tests/qunit as it made sense since they used the MediaWiki environment more heavily. 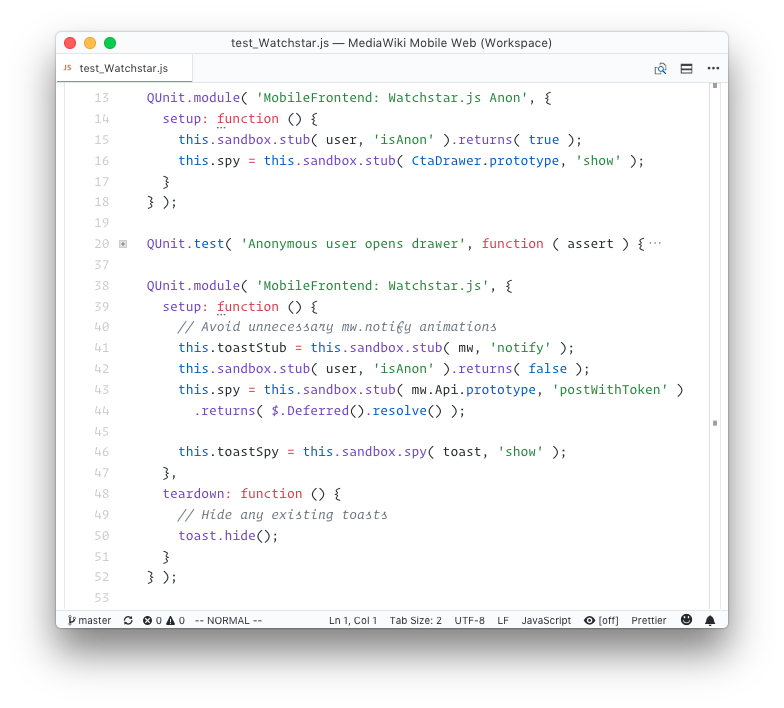 We created a small wrapper around QUnit -mw-node-qunit- that we've been using, which essentially gives us a CLI tool that sets up QUnit with jsdom, jQuery, and Sinon so that it was easier to migrate the QUnit tests in. It was quite straight forward to migrate, especially since most of the Extension:Popups tests from the refactor had been written in a TDD fashion, and were already mostly isolated. There was a bit of figuring out because eventually some pieces of code use mw. * functions or helpers, so we created a stubs.js where we created a few stub helpers for the tests. We also kept a couple of tests as integration tests in tests/qunit, but eventually we did some work to refactor the code and made unit tests for the new code, so we got rid of the integration tests in MediaWiki entirely. With this setup, tests run quite fast, and it is feasible (and we do) run them in watch mode while developing, giving you fast feedback and running your code on save, all from the terminal/editor. The environment doesn't have any global state, or implicit knowledge of MediaWiki, which forces us to write properly isolated tests that don't rely on implicit behavior or state. Finally, the move to a Node.js-based toolchain means we are easily able to leverage other great open source tools without much fuss, for example, for code coverage. We added another script -coverage- which just run the test command, but with the code coverage tool istanbul first, and just like that we got back coverage reports for the frontend code. We recommend this approach for others wanting to improve how they test, and would be happy to help you figure out if this approach would work for you. For example, you can use this CLI runner, even if your JS sources just use globals instead of common.js or ES modules. Overall, the move has gone great and we don't many issues to report. When migrating existing tests, it is sometimes a bit tricky to figure out how to move them to the isolated environment, since most of the MediaWiki JS library is not available as an npm package, so in some occasions we had to restructure the code a bit to not implicitly assume as much of MediaWiki being available, and other times we had to set up some stubs for the tests to run well. This had the added benefit that the dependency on MediaWiki core libraries is explicit in the tests, so we should notice when adding new dependencies or changing them because of the failing tests, keeping the behavior and dependencies explicit. Another extra thing that we have been doing has been maintaining mw-node-qunit, which has taken a bit of additional time. Making sure our wrapper works well with qunitjs, and updating the dependency versions to not fall behind and leverage improvements on the libraries. We will also be looking into moving the repository to the Wikimedia organization in GitHub if other teams or projects adopt this testing strategy. This change has worked really well for us. We are able to run our tests really fast, even without vagrant running. The environment is isolated and really good for unit testing. The CLI wrapper had the specific helpers to ease migration from the existing tests, so it was fairly painless to switch. Because of all of these, the extension has excellent code coverage, developers have an easier time contributing tests, and doing TDD is feasible. There is less uncertainty when refactoring and adding features, and the codebase is easy to work with. A big part of it is because of the unit testing story. We're looking forward to adopting the same approach in other repositories and helping others do the same.